When it comes to starches, rice and pasta often seem to be the most versatile. They can be paired with so many things, from silky sauces to roasted vegetables. However, polenta deserves its time in the spotlight, too! 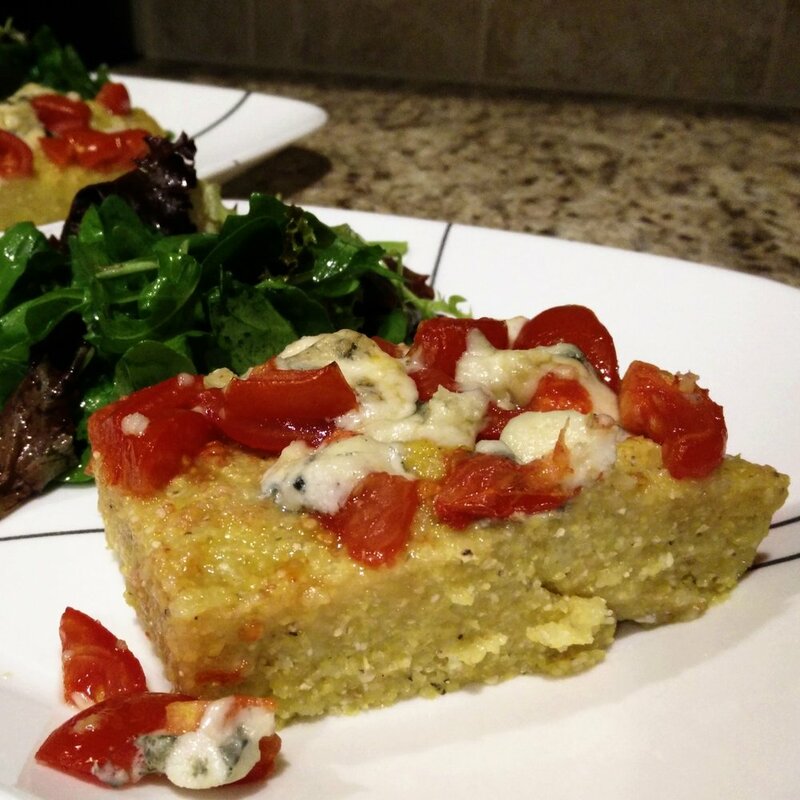 This particular rendition pairs dense, herb-flecked, pleasantly grainy polenta with sweet tomatoes and pungent bleu cheese. I was lucky enough to pick up some local goat-milk Blue Chevrolait, a gorgeously buttery creation from Prodigal Farm in Rougemont. Its rich umami notes stole the show without drowning out the other flavors. Cut with a drizzle of honey, it was the perfect topping for this dish. Grease a square cake or baking pan with one tablespoon of the oil and set aside. Preheat the oven to 450°. Once the mixture starts to bubble, lower the heat to medium-low. Whisk constantly for a few more minutes, or until the mixture is thick enough to start pulling away from the sides of the pan. (My clue that I'm almost done is that I can't hold the whisk like a pencil anymore.) Fold in the remaining tablespoon of the olive oil, the garlic, and the basil. Pour the polenta mixture into the prepared pan. Top with the tomatoes and cheese. Bake for 15-20 minutes, or until the cheese is melted and bubbling. Remove from oven and allow it to set for a few minutes. Lightly drizzle the pan with honey, and then cut the polenta into rectangles. Serve with a lightly-dressed salad and you're good to go! My version of the recipe was based on this Epicurious offering.